"Teen Mom" star Amber Portwood, who this week chose to serve a five-year prison sentence for an illegal prescription drug charge rather than complete a drug-rehab program, is now explaining her decision, her recent suicide attempt and how she believes prison will ultimately help her. "I took 30 Suboxone [which typically treats opioid addiction] within three days," she said in an exclusive jailhouse interview with ABC News Wednesday, speaking publicly for the first time about trying to kill herself as her life spiraled out of control. "The depression took over. I'd just take four to five at a time underneath my tongue, and nod out. I had more than addiction problems. I had, you know, mental problems, too." This was not the first suicide attempt for the 22-year-old Indiana woman, who first starred on MTV's "16 and Pregnant," and whose life later unraveled in front of audience's eyes on "Teen Mom." She was rushed to the hospital last year after boyfriend Gary Shirley called 911. It was in February that Portwood pleaded guilty to felony possession of a controlled substance and admitted to violating her probation. Her sentence was suspended, however, because she entered a court-mandated drug rehab program. Her decision this week to leave the program after three months means that her initial sentence has been reinstated. Portwood is in jail, and is expected to be transferred to prison soon, where she could serve two and a half years of the original sentence. In the interview with ABC News, Portwood said she doubted that she would succeed in the drug-rehab program so she believed it was best to serve her time. "In my situation, I felt in the program there were a lot of eyes on me. And it was very uncomfortable. I was not using my anti-psych medication even," she said. "You know, I was very depressed, all alone, all bitter at everybody. I felt like that wasn't the life I wanted to live, I felt like I'd rather do my time, and get it over with, and make the best out of the situation that's been handed to me." Portwood was also slapped with a domestic violence charge after she was shown hitting Shirley, her daughter's father, on an episode of "Teen Mom." Shirley now has custody of Leah, 3. 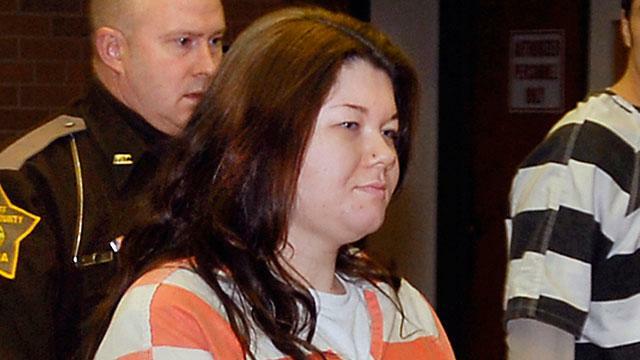 Portwood told ABC News she started "to feel downhill" when Leah was taken away from her. "I felt like I had no reason to even be around, because I was a mom. I felt like that's what I was put on this earth to do, when I had her ... and I started partying and doing drugs because I felt like I couldn't do anything anymore. I lost my whole family, I felt like, they moved away from me," she said. Asked how her absence while in prison would affect Leah, Portwood said she really hadn't been seeing much of her daughter, as a result of the time she spent in drug court and because she and the baby's father didn't have a set schedule for when she could see the girl. "I lived such a busy life and I woke up sometimes and was like, am I too busy for my family? And I felt so selfish. I was so depressed. It became kind of scary for me," she said. "I felt the same way I felt a couple years back when I, you know, tried to commit suicide. When I walked in a courtroom, I was like, if I don't do something, I'm going to have to." She said she believes she'll see more of her daughter during her incarceration. Portwood, who reportedly had attempted suicide before, said she never believed she was making enough progress. "It wasn't just the program," she said. "It was the fact of being alone. It was personal. You know being alone, feeling like you're hopeless, you have nothing, feeling like an addict and you're never going to change, even though in your mind you're working so hard but every time you get to court it's not good enough." She also said she wasn't comfortable with the way things have turned out for her, saying she "should have done more" with what she was given. Despite that, she says, she doesn't regret her decision to spend part of her life behind bars, but acknowledged that it was a hard thing to do. "You want to be free. Who doesn't?" she said. "But you know if you can't do it, if you can't do it, why are you kidding yourself?" But she plans to make the most of her incarceration. "I'm going to take some classes, I'm going to get my GED, take as many programs as I can. You know, just try to better myself for when I do get out and not stay in prison ... I'll be off the drugs, I'll have an education to get me a job, you have to think of the positives in this negative story," she added. Experts, however, disagree with Portman's decision to forgo treatment and spend years in prison, saying that the decision to forgo treatment is just another in a series of bad choices for the young woman. "I don't think she really realizes how severe a penalty she's choosing, when she could have worked outpatient in a drug program, gotten her GED, and also been allowed to take some parenting classes, so that she could develop a relationship with her daughter," Dr. Janet Taylor, a New York-based psychologist, said. While Portwood doesn't directly blame being on "Teen Mom" for her problems, she said it played a role. "Getting money at a young age, going to parties where drugs were given to you, that's what really got me. ... You make your own choices," she said. The pressure that came with being famous, particularly having paparazzi camped outside her house for days on end, was hard to handle. "It's like every time you go out to eat, you know, people are staring at you, talking, and it's hard," she said. "You get paranoid ... It's not normal, to always be paranoid." Still, Portwood said she believes that she must keep going. "I had been at such a low point, I couldn't go any lower," she said. "There's nothing lower than trying to kill yourself. That's why it's probably hard to understand why I did what I did. "But when you mentally know that, you're not right. You're 22, and you tried to take your life twice. And you're 22, and you're still here, you don't want to mess that up."